The race at Plymouth North High School is one of the longest running in the US. I would have to check with those that were there, but I think it dates back to the 1970s or very early 80s. As the story goes, Mark and Frank McCormack sat in class at Plymouth North (then called Plymouth/Carver High) and watched out the window as Tom Stevens, who they had yet to meet, plotted a course for an upcoming edition of the race. Before they had graduated from that school, they had become some of the best ‘crossers in the country. The site was the host to the National Championships in 1986 and 88. It was 1988 that Mark won the Junior National Championships. I remember toeing the line with Mark, Frank, and other notables in those early days when a cross race was likely to include features such as the aptly named “Bud Light Hill of Death”. No one actually died, but collarbones and other parts were known to suffer. Bill Sykes has been the promoter for many years now, with help from the longtime host club, the Mass Bay Road Club. The course has been updated to reflect current standards. In other words, the hill of death is now avoided. Nowadays there are enough participants to warrant separate races so the inexperienced and the not so talented (like me) don’t have to toe the line with the likes of Mark and Frank McCormack any more. Even Mark doesn’t have to line up with the elite if he doesn’t want to. This day, he raced the Masters 35. Over 230 riders showed up Saturday, a few more than we usually had 20 or so years ago. In order to coordinate with the Plymouth Visitor Service Board’s sponsorships of both the race and the upcoming Thanksgiving parade, the race was moved up a couple of weeks on the 'cross schedule. That seemed to have improved the weather outlook because last year was brutally cold and windy. This year the course was soft from recent rain, but not enough to get especially muddy. The Cat 4 Men started the day off at a very reasonable hour of 10:00. 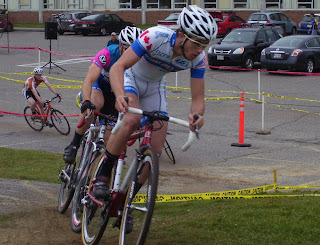 Of the 70 starters, Brian McInnis (JRA Racing), who has already won a couple of Cat 4 races this season, took the long hole shot from the back side of the school onto the race course. But after a lap Syngen Marroco (Mass Bay Road Club) took over the lead and stayed away until the finish a few seconds ahead of McInnis. 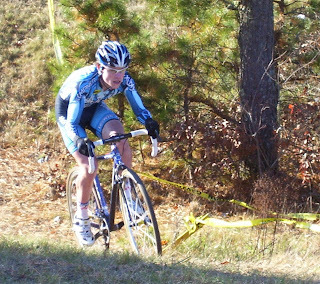 It’s just the first year of racing for 16 year old Syngen and only his fourth cross race. He won at Cycle-Smart/Northampton also. Cat 4 Women - Nicole Cretien (took the hole shot and held on for the lead ahead of the NEBC’s Shannon Madison. Nicole is currently riding unnattached but it shouldn't be long before some of the stronger women's clubs ask her to join. Giula Righi (International Bike Center) was third. Juniors 10-14 - Ian Keough (CLNoonan/KAM) lead from the start with Luke Callahan (Mass Bay Road Club) in tow. Ian finished alone with a big victory salute that he probably learned from his 4 older brothers. Men 3,4 - Starting with this race, a Pedro’s discount card prime was offered for the leader coming out of the hole shot. The hole shot at Plymouth North is a fairly long 400 yards, starting on grass then switching to pavement up a moderate hill. The wide open lower ball field where it starts allows everyone to line up in one long row on equal footing, no need for call ups. Jacob Morrison (Tritown) won the hole shot prime just ahead of the Boston Road Club’s Chris Bailey. Bailey came through within the first half lap and took the Serious Cycles clincher tire prime with one complete lap done. Bailey was then joined by Mark Nicholson (Refunds Now/Casters) and Jesse Perrault (Comprehensive Racing). They tagged along for a couple of laps waiting for a chance to pounce. Then, on the last barriers with a half lap to go in the race, they got their chance and both Perrault and Nicholson passed Bailey. The three stayed together until they were out of site at the back of the course and when they come back into site on the finishing stretch, it was just Perrault and Nicholson with Bailey a couple of seconds off the back. Nicholson took a very close sprint to claim the win. Juniors - Colin Huston (CLNoonan/KAM) took the hole shot prime and kept on going. It wasn’t long before he was riding solo at the front and he won it solo. He came with his family all the way from Kennebunk, Maine and made it worthwhile. Of note, Frank McCormack’s twin sons raced the junior race. Cameron and Brendan are 15 years old now and seem well on their way to having the same build as their dad. In other words, perfect for bike racing (“no pressure guys”). Masters 55 - Dusty Adams (Mosaic) took the hole shot prime and stayed away for the win. I don’t mean to embarrass him, but Crag Walton (Hoosatonic) deserves extra credit for keeping the less dirty side of the bike up after rolling his rear tubular on a tough paved corner in front of the officials stand and most of the spectators. The sound of the metal rim scraping on pavement was horrendous, but somehow he held it up and was awarded a Pedro’s discount card with which he can buy some solvent and glue, hopefully before the next race. Masters 35 - Curtis Boivin (Refunds Now/Caster’s) won the hole shot prime and by the time one lap was complete about 7 minutes later an elite lead group had formed with Curtis, Frankie (like a Brazilian soccer star, he only needs one name around here) (Team Fuji), Markie (no sir name needed in these parts) (Team Fuji), Dan Coady (Welovebicycles.com), Peter Sullivan (Nantucket Velo) and Bill Shattuck (Bike Barn Racing). With three laps to go Markie and Dan were away with Frankie, Bill and Peter about 30 seconds behind. Mark and Dan went into the final sprint together but Dan couldn’t out sprint the former pro on his home course. We’ve seen Mark sit up and let others take a win in Master’s races before, but not today on the course where he learned his trade. Curtis Boivin took third about 30 seconds behind, then Frankie. Masters 45 - John Johnson (Hallamore/Bike Works) came through the finish line out of the hole shot first and got a bit of a gap. But he faded back on the first lap (we all know that feeling when you say end up saying “what was I thinking?"). With three to go, Sam Morse (Corner Cycle) and Bob Bisson (Gearworks/Spin Arts) had control at the head of the race followed by Dave Belknap (Mass Bay Road Club/Bike Link) and Paul Curley (Gearworks/Spin Arts) 20 seconds behind. At the finish, Morse narrowly out sprinted Bisson then a few seconds later it was Curley and Belknap’s turn. They unleashed a blazing sprint (by 'cross standards) starting on the last rise with about 150 yards of pavement prior to the finish line and Curly took it by less than a wheel. This day was almost too nice for ‘cross with nothing but sun and blue skies. At least it rained some overnight to ensure that the course at Plymouth South High School was good and soft. Day 2 of the Plymouth Cyclocross Weekend is promoted by Mike Keough and the CLNoonan cycling team. This is only the second year for this race and a new course was devised by the 5 Keough kids this year. Actually, make that 4 of the 5 kids. The middle child, 18 year old Luke, has been in Europe competing in World Cup ‘cross races for a month now. His parents got a call from Luke while setting up registration for the Plymouth race Sunday morning telling them he had just placed 5th in the Prijnacker, Holland World Cup race. This is in addition to a 7th place in his previous World Cup race. He is now the 6th junior (U19) in World Cup points. Check out his journal of the trip at http://www.freewebs.com/nickeough/lukekeoughjournaleuro.htm . Men Cat 4 – Today I took the opportunity to prove to myself, once again, that my proper place at a bike race is behind the microphone, not on a bike. I let Bill Sykes handle the announcing duties while I suited up and did the Cat 4 race. Therefore, I have no idea what happened at the front of the race, only the tail end. I started at the back and finished there, although for a while during a very hectic start, I did manage to elbow my way up through about a third of the field and then hold onto that position for a while before beginning my slide back to my normal discomfort level. I was holding my own until I crashed remounting and lost about 5 places, then 5 more went by while I was trying to get myself back together. Was I really holding up that many people? As I was told later, Jay Ledieu (Team Psycho) won it from about 1.5 laps before the finish after Syngen Marocco (Mass Bay/Bike Link) had a mechanical problem while in the lead. Brian Kenney (Bike Barn) finished a strong second. Syngen, who won the previous day, finished in the top ten. And no one lapped me. Women 4 – I’m sorry I didn’t catch much of this race as it was run concurrently (2 minutes behind) the cat 4 race I was in. All I know is the winner passed me (ohh, the shame) and she was wearing a Dansko jersey and exceptionally long mismatched socks. Check the results on Bikereg when they are posted to find out who she was. She was going past me so fast I didn’t have a chance to ask her for an interview. She wasn’t the only woman that passed me either (ohhh, the horror). Junior 10-14 - I missed this one too, but one of the Goguen kids passed me (more shame, more horror) so I think he won. They started a minute or two after the women. Men 3,4 - Morgan Hiller (CLNoonan/KAM) took the lead into the grass but by the end of the first lap it was Jesse Perrault in control. He was still in the lead with 2 to go but Morgan was not far behind. I think it was somewhere around this point that the generator died and I had to locate the gasoline supply, hence my attention was diverted and I missed the rest of the 3,4 race and most of the juniors race. Sorry, but I have no report for those. Announcing and taking notes for this blog along with taking the occasional photo is about all I can handle at one time. Bikereg will have the results. I found the gas can (with Jake Keough’s help) and refueled the generator. Masters 35 - Markie (Team Fuji) and Kurt Perham (Bikeman.com) went straight to the front on the official's whistle and led before the technical stuff started. Within a half lap a lead group of 7 formed including three from race sponsor Corner Cycle: Johnny Bold, Kevin Hines, and John Mosher. This group trimmed down to 5 and with two to go, then Markie and the Corner Cycle trio put a small gap on Perham. Markie dropped all but his dirt bike riding buddy Kevin Hines before the finish and then beat him in the sprint. It looks like Markie decided to take no prisoners in Plymouth this weekend with his second win in two days. Then Bold stopped within 5 meters of the line to let Mosher take third. Perham came across a few seconds later for 5th. You gotta give Kurt Perham credit for coming into the home territory of 4 of the best Masters cross racers in the country and holding his own. If you had any doubt that they are amongst the best, just check the Verge points standings: in the 35 plus, Bold is 1st, McCormack 2nd, Hines 4th, and Mosher 9th. Perham, who is from Brunsick, Maine, is 8th. Hines and Mosher are also the top two in the 45 plus. Masters 45 - Paul Curly (Gearworks/Spin Arts) and Mark Gunsalus (Team Fuji) led with one lap done and again with two complete. But with three to go Curly was uncharacteristically dropped and Gunsalus carried on solo. We found out later that Curley had lost time with a mechanical problem. Dave Belknap (Mass Bay/ Bike Link) and Bob Bisson were a ways back in 3rd and 4th. Gunsalus won it by a few seconds, then Belknap out sprinted Bisson, the opposite result of yesterdays match up for Belknap when Curley got him at the line. 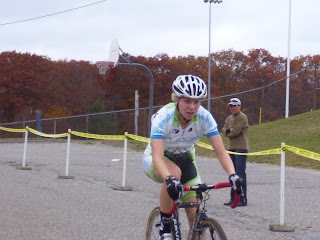 Women Pro123 – I was herding little children on bikes and announcing their races during most of the featured women’s race so I missed quite a bit of it, sorry. When I got back to the race, Elle Anderson (Noreast) had a 50 second lead with 2 to go over Andrea Smith (MRC). But with 1 to go, Andrea had cut the gap in half. Elle’s lap times had gotten quite a bit slower so there was a chance that if Andrea could keep the pressure on, she just might catch Elle by surprise before the end. But it didn’t happen. Apparently, Elle had eased off a little bit knowing that she had a solid lead and wasn't in any trouble. The gap stayed the same at the end, 30 seconds or so. Minuteman Road Club took 3 of the top 5 places. MacKenzie Dickie (Colavita) took third. Let me know what you thought of the races. And, what would you think about making it a three day 'cross festival with a Friday evening race under lights some place (kind of like a mini Cross Vegas)? Also, I plan to add a lists of cycling blog links to this site soon. Let me know about yours and I'll be happy to trade links with you. NEBC’s *name unknown check bikereg*. That was Shannon Madison, who also finished 4th on Sunday. Great racing for sure this weekend! Loved the South course changes, but that race was TOUGH.